Beginning Our New Life In Norfolk! I’m back! After taking the plunge and leaving London in December 2015 to move to the country, we’re now living in our new permanent house in a North Norfolk village. “We” means my husband, Millie the cocker spaniel and me. Our adult children remain living down south, our son in Surrey and our daughter in Hampshire. And I have to tell you that I’m not the same person that I was in December. Not only do I feel more relaxed and much happier being out of London but I’m currently almost 3 stone lighter than I was when we moved. This is mostly due to the fact that I joined a local Slimming World group in January but also because I haven’t done any baking ‘for pleasure’ at all since we’ve been Norfolk residents. This wasn’t a conscious choice – our temporary accommodation before we moved had a very tiny kitchen and all our possessions were in storage – but it has certainly helped my waistline! However I also don’t have anyone to bake for as most of my cakes were previously eaten by work colleagues and at the moment I don’t have any of those! There was however some baking that needed to be done. 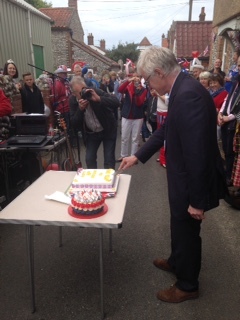 The village where we were living between leaving London and moving to Norfolk held a street party on Sunday 15th May in honour of the Queen’s 90th birthday. The date was mid way between her actual birthday in April and her official one in June and fortunately the weather was good. I ended up making a celebration cake for the event as the organisers thought they had been let down by the person who had promised to make one. 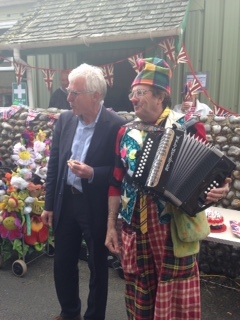 On the day, the other person did in fact produce a cake which I have to say, wasn’t quite the all singing, all dancing, ‘showstopper’ they had promised as you can see from this photo. 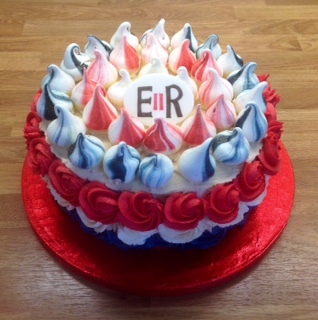 My cake was small but perfectly formed which was lucky as I only had a day’s notice to make it. I wanted to make it fit the theme so hence the red, white and blue colour scheme. I even made a little plaque by hand which I was quite chuffed with. Here it is – what do you think? 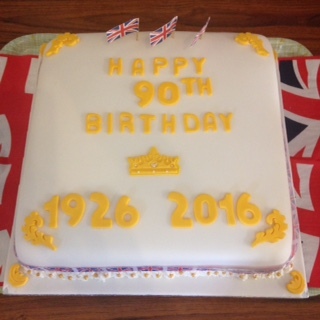 Norman is obviously a man of good taste as he thought my cake was delightful – I noticed he scoffed a large chunk once it had been cut up! Anyway, between sorting out the house, baking for the street party and finding employment (I’ve just got a job with a local hotel chain which will be very different to my previous HR roles) I’m focusing on losing some more weight and getting into shape while not neglecting my blog any more. I have to say that I’ve tried pretty much every diet going and if you love food, I can honestly say that Slimming World is excellent. Decent portions, nothing forbidden and no wretched points to count – what’s not to like? I’ve really missed writing this blog and I’m glad I can now focus on it again. 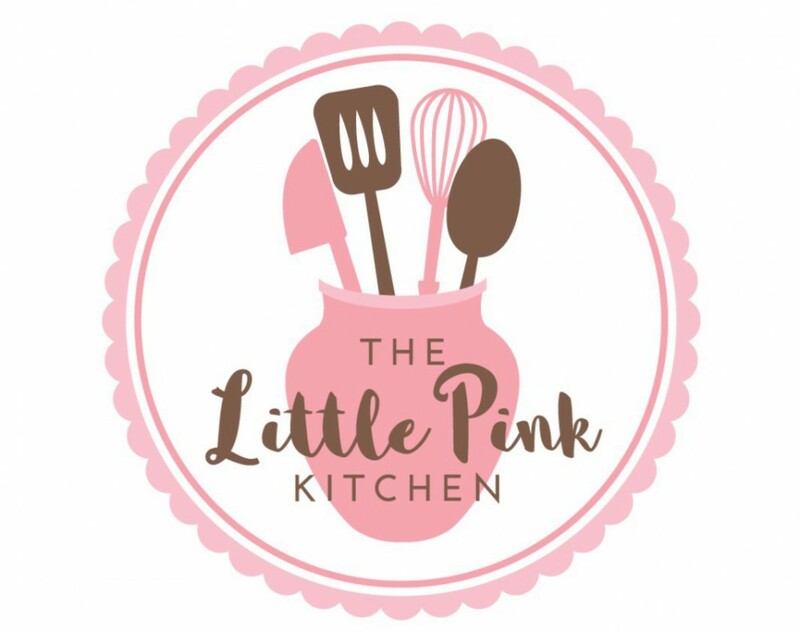 Watch this space for some tasty recipes, various reviews and of course, some random thoughts. I’ve set up another blog where I’ll be posting things that are relevant to Norfolk such as local events, local foodie producers and so on. This will be at: www.midlifenorfolkwife.com – have a look in the next few days when it’s up and running. If you press a button you can ‘follow’ my blog and you’ll receive an email as soon as I’ve posted a new article.